Of all my many murders, committed for love and for better reasons, the first was the most important. So begins Jane Steele by Lyndsay Faye (March 2016, G.P Putnam's Sons, ISBN13: 978-0399169496). Who can resist an opening line like that? Between the incredible cover art and those first few words, I was roped in and along for the ride. I didn’t even bother to read the inside cover. One quick swipe of my library card and Jane Steele was coming home with me. The book, it turns out, is a historical novel. Set in what I suspect to be nineteenth-century England, this novel is like no historical novel I’ve ever read before. Jane begins as a quiet girl with a deceased, rich father and a French mother who can do little but paint or drown her sorrows with alcohol. They live on the edge of a large estate that Jane is destined to inherit, but everything changes after her mother dies. In a matter of days, her aunt gains control of the property and her older cousin attempts to assault her. When she pushes him over a small cliff in self-defense, she commits her first murder and never looks back. Life takes Jane many sordid places after that including boarding school and London, and no matter how tight of a spot she’s in, she always keeps murder in the back of her mind as a means to escape. As a reader, you come to expect Jane to kill, but the fun is in watching how she does it and why. My favorite kind of character is one that I can root for, even in the face of them doing horrible deeds. And I do want Jane to succeed. She seeks vengeance, seeks to take back what’s been stolen from her, and I’m sticking around until the end of the novel to see how she does it. Her revenge was delicious. I was cheering as I read, thinking more historical novels ought to have bad girls like Jane. My big criticism of the book is that there seems to be a huge pause in the middle. For the first half of the novel, Jane is trying to survive her Aunt taking over the estate, getting shipped off to boarding school, and traveling to London. About halfway through, everything comes screeching to a halt as she abandons the life she’s built to reclaim her lost estate. This was a little jarring to me, but pushing through to the end of the book was definitely the right choice. 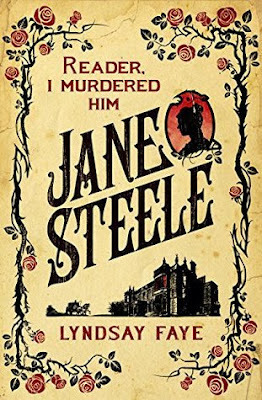 Another slight annoyance was Faye’s reliance on the constant comparisons between Jane Steele and Jane Eyre. In fact, there are so many references, that I’d recommend brushing up on the plot line if you haven’t read the book or seen the film. The epitaphs at the beginning of each chapter will shed some light, but I often found myself skipping them. To be truly honest, I have little patience for them and even less for Jane Eyre. It’s not one of my favorite books, but this homage convinced me that maybe I need to give it a second chance. I’ll definitely be checking out Faye’s other books. Born and raised in Michigan, Emily Morley is an artist and aspiring author who’s been writing and illustrating books since she was six years old. She gravitates towards fantasy (hello, fellow Harry Potter fans) and books about complicated characters overcoming the impossible. She’s also an avid traveler who’s managed to read on six continents and hopes to add the seventh soon. When she is home, she likes to curl up with a huge cup of steaming tea and a good, thick book. I am very curious about this book, and have been eyeing it for a while. Thanks for sharing...and for visiting my blog. This one has recently come across my radar screen and I definitely want to read it. Interesting connection between Jane Eyre. Thanks for the review.